Aeromexico, Mexico’s largest network carrier, plans a revamp to its Mexico City hub during 2014 to maximise connectivity as part of its strategy to strengthen the airport as a connection point to the numerous markets it serves in Latin America and solidify its place in the domestic market. The carrier also plans to phase out its smaller 50-seat Embraer ERJ-145 jets in Mexico City by YE2014 to improve its competitive position and increase its seat count at the slot-controlled airport. Other changes Aeromexico plans to implement includes the introduction of a new shuttle product in some of Mexico’s busiest business markets. Aeromexico’s product and schedule improvements occur as Mexico’s four largest carriers – Aeromexico, Interjet, Volaris and VivaAerobus – become firmly entrenched in their respective business models and continue to expand in order to ensure they capture their fair share of Mexico’s domestic market. As a comprehensive full service carrier, Aeromexico needs to position itself as a competitive force in all passenger segments in order to sustain its stature as Mexico’s leading airline. Introduction of a new low fare product Contigo in 2013 in transborder markets from Guadalajara was an imortant move. 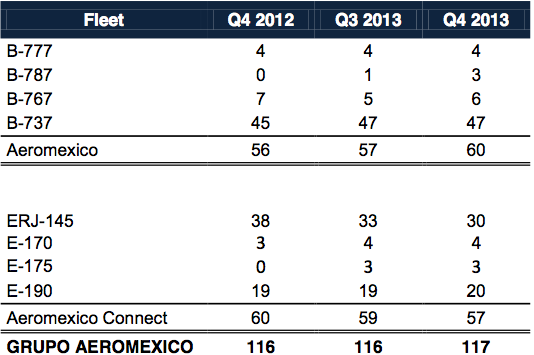 Part of Aeromexico’s planned network optimisation for Mexico City during 2014 includes expanding its connecting banks from six to 10. Once the changes are complete, carrier executives estimate increased connections to 35 additional cities. Since Mexico City is slot constrained, Aeromexico is accomplishing the expansion of connecting banks by re-designing its network to improve connectivity. Presently, approximately 20% of Aeromexico’s flights in Mexico City connect to other destinations. The carrier’s executives concede that is “low by international standards” and are working over the short term to increase connections to the “mid-30s”, Aeromexico management recently explained to analysts. The elimination of the smaller ERJ-145s should help bolster connections as Aeromexico expects by 4Q2014 to operate only 70 and 90-seat Embraer 170/190 jets and narrow and widebody aircraft from Mexico City. One of its main domestic competitors in Mexico City, and the second largest airline at the airport (based on seat deployment), Interjet, operates a fleet of 93-seat Sukoi Superjet 100s and 150-seat Airbus A320s. At YE2013 Aeromexico (through its subsidiary Aeromexico Connect) operated 30 ERJ-145s. Nine of the jets are scheduled to exit the carrier’s fleet in 2014 along with four Boeing 737-700s and a single 767-200. The airline expects deliveries of eight Boeing 787s, six 737-80s and 12 Embraer 170s/190s during 2014. Based on current schedules in Innovata (17-Feb-2014 to 23-Feb-2014), Aeromexico deploys its ERJ-145s from Mexico City to numerous markets including, Acapulco, Aguascalientes, Bahias, de Huatulco, Campeche, Ciudad del Carmen, Ciudad Obregon, Culiacan, Durango Guadalupe, Guadalajara, Guanajuato Del Bajio, Ixtapa, La Paz, Los Mochis, Manzanillo, Matamoros, Mazatlan, Merida, Morelia, Reynosa, San Luis Potosi, Veracruz, Torreon, Oaxaca, Tapachula, and Tuxtla Gutierrez. Another tactic Aeromexico plans to use during 2014 to bolster its seat deployment from Mexico City is the introduction of a shuttle service in Mar-2014 in three of Mexico largest business markets – Mexico City-Monterrey, Mexico City-Guadalajara and Monterrey-Guadalajara. The carrier aims for hourly service in those markets, and plans to offer 16 daily flights from Mexico City to Guadalajara and Monterrey and seven between Monterrey and Guadalajara. Aeromexico also plans to operate two-class aircraft on the shuttle service with improved onboard amenities. It is also creating dedicated ticket counters and gates for the shuttle flights. Those three new shuttle markets are all served by Mexico’s four largest domestic carriers – Aeromexico, Interjet, Volaris and VivaAerobus. Based on data from OAG, Aeromexico’s seat deployment in those markets has fallen year-on-year. During the week of 17-Feb-2014, approximately, 28,000 seats are deployed from Mexico City to Guadalajara, with Interjet holding a nearly 38% share. 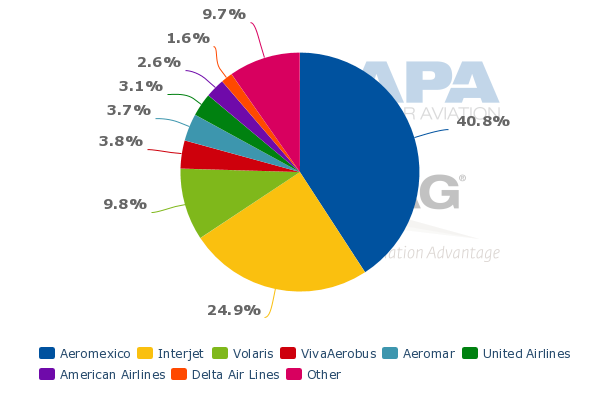 During the same timeframe in 2013 Aeromexico had the largest seat share at 38% compared with 32% for Interjet. After growing its seat deployment by 4%, Interjet has overtaken Aeromexico as the leading carrier on the route as Aeromexico’s seat deployment fell 13% year-on-year. A similar pattern has occurred in the Mexico City-Monterrey market. Interjet increased its seat deployment on the route by 26% year-on-year for the week of 17-Feb-2014 while Aeromexico’s seats fell 2%, resulting in Interjet’s current 43% seat share surpassing Aeromexico’s 37% share. The dynamics are different in the Monterrey-Guadalajara market. Volaris recorded nearly 169% seat growth year-on-year for the week of 17-Feb-2014 while Interjet’s seat growth was flat. Aeromexico recorded a 15% decline and VivaAerobus posted a 10% rise in seats deployed. Volaris is Guadalajara’s largest carrier in terms of seat deployment (holding a 33% share), so it is not surprising that it has worked to increase its presence to Monterrey. Given the build-up by other carriers in Aeromexico’s shuttle markets, it needed to develop a strategy to leverage its position in Mexico City to create attractive schedules and products for business travellers in order to ensure those customers do not jump ship to other carriers. The shuttle product, along with its efforts to expand connection opportunities in Mexico City should improve its competitive standing on those key business routes. Aeromexico only plans to add one new destination to its long-haul network in 2014 with flights from Mexico City to Rio de Janeiro beginning in Jun-2014. Rio joins Aeromexico’s flights to Sao Paulo in Brazil, and presently no other airlines operate between Rio and Mexico City. Carrier executives remarked that part of Aeromexico’s revamp in Mexico City to improve connections was to make the airport attractive as a connecting point between the US (particularly the US west coast) and Latin America. The airline’s management believes adding routes including Rio and Quito in Dec-2013 help bolster Mexico City’s connecting capabilities. Aeromexico also plans to add an additional frequency to Santiago in 2014. Its existing Latin American network includes service from Mexico City to Bogota, Buenos Aires, Caracas, Havana, Lima, Guatemala, San Pedro Sula and San Salvador and San Jose, Costa Rica. By May-2014 Aeromexico aims to operate five Boeing 787s on daily flights to Paris and New York, four weekly services to Tokyo Narita and three weekly flights to London and Madrid. Additionally, Aeromexico plans an additional frequency to Shanghai in 2014. The carrier currently offers three weekly flights with a stop-over in Tijuana. Aeromexico plans 15% to 18% capacity growth during 2014, with 19% to 22% of the supply deployed in international markets versus 9% to 12% in the domestic market. Airline management admits that during 2013 there was particularly “high sense” of additional capacity by every domestic player in the market. The airline believes the growth should ease a bit in 2014 as it estimates the Mexican domestic industry should add between 15 and 20 aircraft in 2014 versus 20 to 30 the year prior. Aeromexico’s own capacity growth is increasing year-on-year in 2014 from a 6% increase recorded in 2013. Management touts the carrier’s competitive position in Mexico City as a tool in its arsenal to beat back some of the competition in the domestic market, and also “sees opportunities to add additional seats in the transborder market”. Perhaps an expected rise in Mexico’s GDP growth in 2014 to 3.9% (compared with expansion of 1.3% in 2013) is fuelling Aeromexico’s confidence in both expanding its supply and the strategic changes it is implementing in Mexico City. The carrier is clearly working to leverage the competitive advantage it has in providing connections in Mexico City to a broader international network than its Mexican domestic competitors while making product and schedule improvements in the domestic space to regain lost ground in market share. Aeromexico seems to have competitive levers it can pull that are not available to all its competitors – a larger international network, an improving schedule for business travellers and a close relationship with fellow SkyTeam partner Delta Air Lines, which has an equity stake in Aeromexico. Delta no doubt has weighed in on at least some of Aeromexico’s strategic moves for 2014, which are likely to create even more intrigue in the evolving Mexican market.